John Maclauchlan Milne was encouraged by his father - the Scottish landscape painter Joseph Milne. His father's influence is apparent in his early work, before his style was transformed by the Scottish Colourists and modern French painters, particularly Cézanne. During the First World War Maclauchlan Milne left his home in Dundee to fight in France on the Western Front. France had a strong impression on the young artist. From 1919-1932 he spent long periods in France. 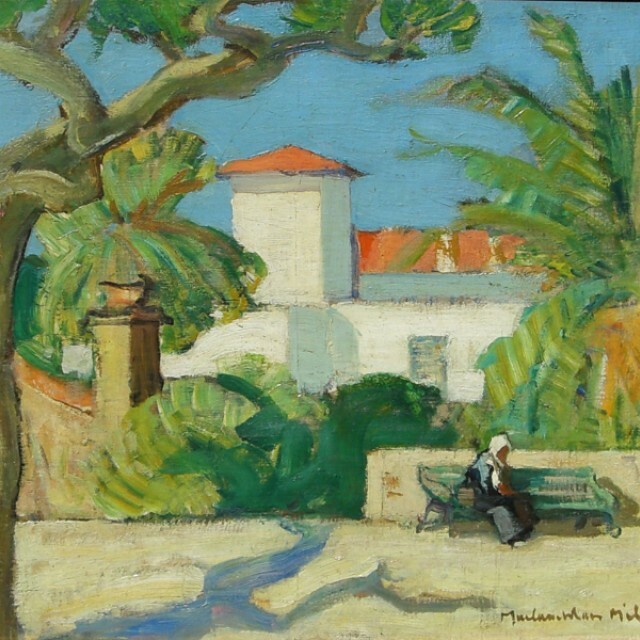 Initially he stayed at rue des Quatre-Vents in Paris but by 1924 Milne was in Cassis with Peploe, Cadell and Duncan Grant. They also spent considerable time in San Tropez. Almost all his exhibits in the 1920's were of Mediterranean subjects. His obituarist wrote 'like Peploe, he saw Cézanne and was immediately conqueredHere in the Midi, Milne found himself and the impact of this new experience stamped all his subsequent work'. At the outbreak of the Second World War, Maclauchlan Milne returned to Scotland and settled at High Corrie on the isle of Arran. Here he painted the whitewashed cottages, the little jetty below the village and Goat Fell, the highest peak on the island. He died in Arran in 1957.